A number of Samsung Galaxy M20 features have been revealed in a leaked user manual of the smartphone. Separately, Samsung Galaxy M20 specifications were also tipped. The smartphone is expected to be unveiled as a part of the company's brand-new Galaxy M-series on January 28 at a launch event in New Delhi. It is likely to be joined by Galaxy M10, a budget phone, and Galaxy M30, a mid-range device. The company is aiming the Galaxy M lineup at the millennials and it will be available via Samsung Online Shop as well as Amazon India. 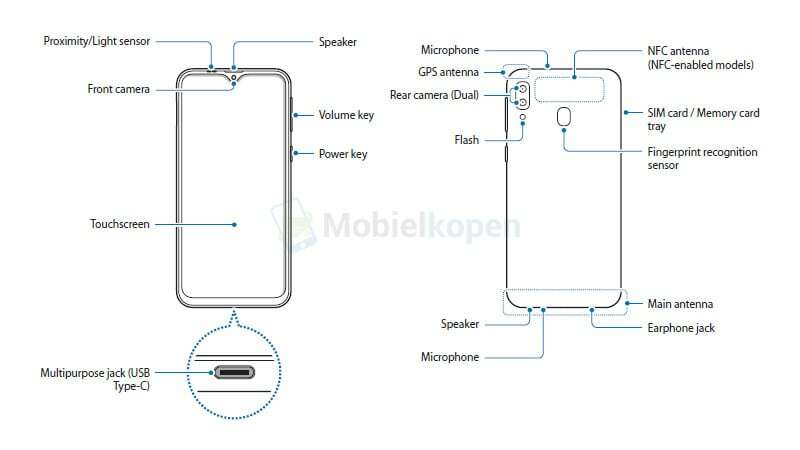 The purported images of a Galaxy M20 manual on Monday appeared on a Dutch website Mobielkopen. These images include a number of sketches that reveal the phone's design and select features, including the presence of Face Unlock support. The sketches seem to be credible as they are in line with the promotional images shared by Amazon India on the Galaxy M-series teaser page. The alleged Samsung Galaxy M20 sketches reveal the Infinity-V display (Samsung talk for a V-shaped display notch), 3.5mm audio jack, USB Type-C port, and rear fingerprint sensor. Additionally, one can see dual camera setup on the back with an LED flash as well as a volume rocker and power button on the right side. According to a report in SamMobile, the Galaxy M20 is likely to pack a massive 5,000mAh battery with fast-charging support. The phone will also come with a 6.3-inch screen with full-HD+ (1080x2340 pixels) resolution and 32GB/ 64GB of inbuilt storage with a microSD card slot for memory expansion. In terms of the imaging capabilities, the consumers can expect to see a dual-camera setup with a 13-megapixel primary sensor with f1.9 lens and a 5-megapixel secondary sensor with f2.2 lens. The 5-megapixel will reportedly be used to capture wide-angle shots. The report also adds that the recent benchmarking leaks point toward the presence of Exynos 7885 SoC and at least 3GB of RAM. Further, the Galaxy M20 will run on Android 8.1 Oreo with a custom UI on top. According to a recent IANS report, Samsung Galaxy M20 will retail around Rs. 15,000, whereas the Galaxy M10 will carry a price-tag of Rs. 9,500. As we noted earlier, Samsung is hosting a press event on January 28 in the country to unveil the Galaxy M lineup.